Nope, it's not rhubarb, even though some of the stalks have that suggestive red color. 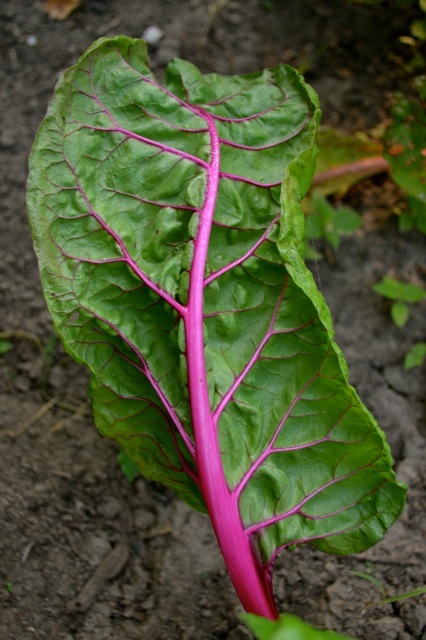 Chard is cooking green, used similarly to spinach--actually a relative of spinach too, and beets. We grow a variety called Bright Lights which about sums up the many colors that grace this gorgeous plant. Actually, because chard is so beautiful, we here at the farm often fight over who gets to pick these beautiful leaves and arrange them into their bunches for market. Chard leaves are quite succulent and tender and have a flavor similar to spinach. Some folks enjoy the young leaves fresh in salads, but mostly chard is a cooking green. Any recipe calling for spinach, like lasagne for example, could be a great place to experiment with chard! Chard stems are edible too! Because they keep their color when cooked they add a tremendous amount of color to any dish, and are a great source of nutrition. They do carry a good dose of oxalic acid, however, just like rhubarb, and are best enjoyed cooked through to neutralize the acid. Here on the farm we interchange chard and kale as a steaming green with most meals. Sometimes we add a bit of cider vinegar to it, or salt and pepper, and sometimes we just enjoy their flavor, fresh out of the steam pot. A word to the wise: The more color in your diet, the more vitamins and minerals you're getting!